As you know, I really like Korean things, including drama and movies. I have watched many Korean drama and some movies too, and now I want to review a movie that I think you should watch. My Annoying Brother! In Korea, it is named Hyung (mean: brother). 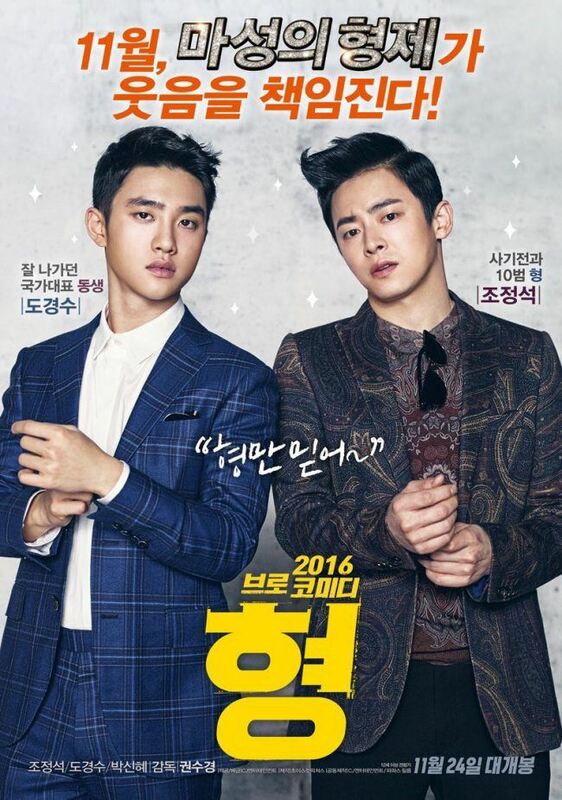 This is a comedy-bromance movie, starring top actors and actress, such as Jo Jung-suk, D.O, and Park Shin-hye. This movie is the top movie among the other movies that had been released at the same week and it hit more than 1 millions views within 4 days from its released. I have watched this movie not long ago and I think this is a good movie and inspirating too. I will reveal the reason why this movie is good below, ok? As I said, this movie is starring top actors and actress. I love the casts and their own characters. 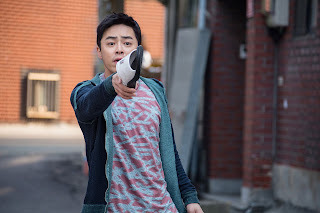 Jo Jung-suk as Doo-shik who is the older. He used to be a con artist but I think since he met Doo-young he turns into a good guy. D.O as Doo-young who is the younger. Doo-young is judo athlete who loses his sights because of an accident. At first, he got depressed but then he can stand again with the help of his brother, Doo-shik. Park Shin-hye, this beautiful actress stars as Lee Soo-hyun who is Doo-young judo coach that put so much cares to Doo-young especially after Doo-young got an accident. She also helps Doo-young to live his life again. So first, Jo Jung-suk, I think this wonderful actor developes the character very well. He stars as Doo-shik who is a con man that hungry for money. He even uses his brother to get out of the prison. Yes, he was in the prison at the beginning of the story. At first, he doesn't care about his brother but he turns to take care of his blind brother. He actually cares for his brother and he has a big heart. He melts my heart when he does little things to his brother. He plays an important role in Doo-young's life and I think you will know it right away you watch this movie. Ok, let me fangirling over this boy's cuteness for awhile. You have to know that Do Kyung-soo or D.O is a member of one of the biggest idol group in Korea, EXO. He has angelic voice that make his fans go crazy. He is also one of the best actor among the idols. He starred in some dramas and movies. He has great acting skill that he proved in this movie. I just became so proud as a fan when watching him (other fans must be feeling the same as me:)). Ok, let's start reviewing him. 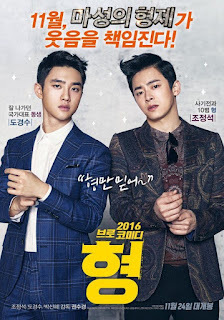 Like his partner, Jo Jung-suk, D.O developed and fit the character very well too. He acts well as a blind brother who is trying to get his life back. His character seems to have gone through some messes at the beginning. I was very sad knowing that he should get blind and get depressed even he thinks that even being died is better, plus, when Doo-shik came back and just give him so much pressure. But as the story flows, he got better. He is back to do judo again and his relationship with his brother get better too. But, at the end, he faces another sad story that make me crying hard. Ok, you have to watch this to know how great is his acting and how sad the story is. Park Shin-hye in judo movie? You don't have to worry about the acting skill of this beautiful actress. She has experienced in various genres of dramas or movies. This time, she starred as Lee Soo-hyun, Doo-young judo coach. As I said, she plays an important role in Doo-young's life. She takes a lot of cares to Doo-young since he got none by his side and she is the first who is having thought of taking Doo-young back to Judo after the accident. Here's what I love again is the bromance relationship between the brothers. Their love/hate sibling relationship is amazing. I mean I can't think of another actors who can play these roles beside them and I think they are pretty look-alike, don't they? I personally think that the storyline isn't that 'wow'. It is just a simple story but it is delivered well, and I couldn't guess how the ending is. At first, I thought that it might have a happy ending, but there is not any happy ending. So, the story begins with the accident that happened to Doo-young that causes him blind. Meanwhile, his older brother, Doo-shik, who was in prison, is trying to get out of there after heard that Doo-young got an accident. He uses his brother to get out of the prison. Of course he doesn't care about his brother and he just wants to get out of there. Finally, he is back to his house. Doo-shik finds Doo-young gets depressed but he doesn't care and is pretty rude to him. But, as the time goes by, he realizes that he shouldn't leave his brother behind. At the same time, Lee Soo-hyun (Doo-young's coach) thinks that Doo-young has passion in judo that he is possible to return to judo again. She asks Doo-shik for help. This is one of the most heartbreaking moment. It is when Doo-shik teaches Doo-young to run again. Doo-shik keeps telling Doo-young to trust him more than anything. It gives so much effects to Doo-young that he wants to do judo again. Another fact that makes me sad is the fact that Doo-shik is diagnosed with pancreatic cancer when they start to love each other. He can't live any longer and he wants to keep this information from Doo-young so that he can focus on judo paralympic that he is going to attend overseas. As judo has run over his blood, he can head to final. This one is the most heartbreaking part of all scenes I think. When the final is about to start, Doo-young feels down because he has a trauma from his past accident. His coach, Lee Soo-hyun, encourages him. She said, if Doo-young can't do it for himself, then do it for his brother who is suffering from his illness. So, he tries he best for winning to make his brother proud and he got what he wants. At the end, Doo-shik passes away and Doo-young lives as a judo athlete without his beloved brother by his side. Such a sad story, I think. But, trust me, this movie is sooooo good. I even cried at the end. Just bring some tissues with you when watching this. Oh, there are also some sweet moments between this brother. It is not only the sad moments but there are some moments that warm your heart. Finally, this movie gives me so much emotions; smile, laugh, depression, sad, sorrow, and many more. It is not the blindness or ex-con man aspect, but it is more in terms of the hope and strength you gain from your family member, even you always get annoyed by them. I can't praise enough how great D.O's performance and how wonderful it was watching the annoying yet loveable side of Jo Jung-suk. Last words, I recommend you to watch this amazing movie. DREAM DESTINATION? - SOUTH KOREA!